Subtitle: Meanwhile, on the ground, the realities are looking grim for war. Additional war signs are swirling through Mid-East. Is it going to be Peace with a Palestinian State, or War -- or both? "The United Nations Security Council has for the first time passed a resolution calling for a Palestinian state alongside Israel. The US-drafted document 'affirming a vision' of a Palestinian state was backed by 14 out of 15 members of the Security Council, with the abstention of Syria." Americans who have not been playing close attention to the events in the Middle East for these past 50 years will probably not realize the significance of this United Nations resolution, nor of the probable portents which may flow from it. Since the creation of the Jewish state on May 15, 1948, America has resolutely stood beside Israel, through five wars and through three decades of civilian massacres by the Arabs. Oh, yes, we have carried out diplomatic maneuvers designed to maintain the public illusion that America is "balanced" in our approach to the Israeli-Arab conflict, but the hard military reality on the ground has always demonstrated our pro-Israel slant. Camp David is an excellent example: even as President Clinton was "pressuring" Israeli Prime Minister Barak into giving Arafat more land and more control than any Prime Minister before him had even contemplated, American cutting-edge technology, weapons transfers, and military-diplomatic exchanges continued to flow quietly so as to ensure Israel's continued "qualitative edge" over the Arabs. At the United Nations, the United States has consistently stood against the entire world of nations, acting boldly on behalf of Israel, using its veto power in the Security Council to prevent caustic resolutions from passing that would officially place the Security Council in direct opposition to Israel. The U.N. General Assembly has long been taken over by fervent Israel-hating nations that continually pass the most rabid anti-Semitic resolutions possible. Therefore, when the United States backed this proposal calling for the creation of a Palestinian State within the land of Israel, that action was a very, very large reversal of its long-running policy. In introducing this proposal, the Bush Administration reversed decades of consistent American policy! Israel "welcomed" this resolution, and even called it "balanced"? Successive Israeli governments for the past five decades have resolutely refused to even consider an independent Palestinian state within its tiny country, correctly stating that such a creation would produce a military nightmare. Please look carefully at the two maps to your left. 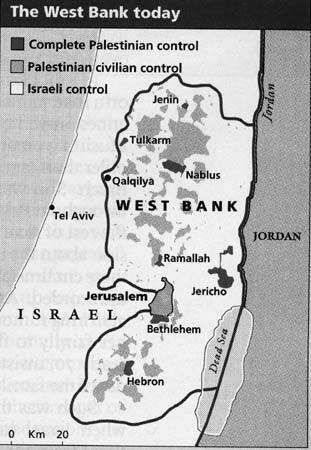 You will see that, in the U.N. Partition Plan of 1947, the Palestinians controlled contiguous land, whereas in the West Bank Today map, you can see that the Palestinians are scattered in enclaves throughout the entire country. From a military standpoint, this present configuration presents a nightmare. Because the Palestinian presence is so scattered, Palestinian militia can more easily block key roads, intersections, and bridges throughout Israel; conversely, the IDF would have to devote more manpower and military resources to guaranteeing that these key roads and bridges remained open and free for military use. The danger is that relatively small numbers of Palestinian militia might be able to tie down tens of thousands of highly trained Israeli soldiers, thus making Israel's defense of her borders with Egypt and Syria less effective. Therefore, you can understand why Israel has consistently refused to allow such a Palestinian state to be established; its leaders know full well they would be playing right into the plans of the Arabs to annihilate her through this next war. Successive Israeli governments -- both Liberal and Conservative -- have been equally adamant in their refusal to allow such a Palestinian state to be created. In fact, the people of Israel were so sick and tired of the Liberalism of Prime Minister Barak and of Shimon Peres that they elected Ariel Sharon to make sure that a Palestinian state would never be allowed. Yet, here we have the Sharon Government praising this U.S. Resolution as "balanced". In late September, 2001, Bush suddenly announced that he supported a Palestinian State, and in early October, Sharon shocked Jews everywhere by stating that he would give Arafat his state under the "right conditions". In NEWS1587, we revealed that Pope John Paul II signed an agreement with Yassir Arafat on February 15, 2000, in which the two men agreed that a Palestinian State should be created! These two men signed this agreement even though they did not consult with Israel at all. What a slap in the face of the Israelis! These two men signing this agreement present quite a spectacle: Pope John Paul II is the current resident of the Papacy, the future False Prophet [NEWS1052], while Arafat is thoroughly controlled by the Illuminist Russian KGB [NEWS1429]. Thus, we can rightly call this agreement part of the master global plan of the Illuminati. This agreement would fulfill Step 3 of the planned New Jerusalem Covenant Project of which I was first aware during a House of Theosophy seminar for members-only on August 18, 1991 [NEWS1052]. This plan envisions five steps by which Antichrist will appear. Step 1 --Three global conferences were to be held simultaneously -- Religious, Economic, Political. Religious conferences will create spiritual equivalent to United Nations. NOTE: These three global meetings finally occurred, from August 28-September 10, 2000, as explained in NEWS1395, NEWS1400, NEWS1403. Step 2 -- "Threat of war" must be maintained until all the desired changes are in place. NOTE: Right on schedule, Arafat began his Intifada September 29, 2000, just 19 days after the three simultaneous conferences had been completed. The New Jerusalem Covenant Project Plan was on target and was being carried out! At this point, control of Jerusalem might be in the hands of the United Nations or an international control of some sort, and a Palestinian State declared. The "birth sorrows" of the birth of Antichrist as Jesus predicted in Matthew 24 also have yet to be fulfilled: "wars, rumors of wars ... earthquakes in many places". At the right moment, all hell will literally break forth. The planned World War III of Albert Pike's demonic vision will begin. Perhaps the catalyst will be the destruction of the Dome of the Rock. Perhaps Arab terrorists will annihilate Mecca with an atomic device. Whatever the trigger event will be, this destruction will be sudden, unforeseen by the masses of the people, it will thrust the world into war and will cause Jerusalem to really be the "cup of trembling" the Lord predicted in Zechariah 12. Literally, every Muslim nation on earth will declare war on Israel and begin to march against Jerusalem. 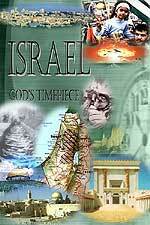 The annihilation of the Palestinians foretold in Obadiah 15-18 will occur [NEWS1422]. North Korea will invade South Korea, and China will invade Taiwan, completing the World War. Riots will occur in our cities, Arab terrorists will really and truly begin to strike within our country, and chaos plus fear will reign supreme. The very fact that key leaders of the world are edging toward a Palestinian State is a major news story in and of itself. Since the late 1970's, Arafat's men have been carrying out the most extreme acts of violent, bloody, and death-dealing terror the world has ever seen. First they highjacked airplanes, then they invaded a cruise ship in the Mediterranean, then they turned to the most bloody suicide bombings in world history. This latter technique of killing innocent civilians not only was originated by Arafat and his Palestinians, but perfected to a high art form. Today, innocent civilians are being killed as they travel to school, as they ride the roads, as they go to and from church, and as they shop in crowded downtown shopping malls. In the Sbarro Pizza attack, the head of a little Jewish girl was seen rolling down the sidewalk! Since 9/11, President Bush has repeatedly told the world that he will not tolerate terror from anyone for any reason, anywhere. Bush and his officials have repeatedly stated that they will go after, attack, and destroy, any such perpetrators of civilian terror. For this reason, we expected Bush to go after Yassir Arafat with a vengeance, shutting down his entire Palestinian operation. Yet, despite high-sounding rhetoric against terror, Bush seems about to reward Arafat's 30 years of terror by giving him his own Palestinian State, with borders yet to be defined. When Yassir Arafat gets his Palestinian State, it will be like a lifelong bank robber being rewarded with his own bank! Yet, the real story in this entire sorry affair is that hard-liner ex-general, Ariel Sharon, is quietly throwing his support behind a Palestinian State. As we stated earlier, Sharon told a group of Jewish voters in early October, 2001, that he would give Arafat his state, under the right conditions; since his remarks came just a few days after Bush had voiced his support, one could only conclude that Sharon was following orders by announcing his support to reward Arafat. Through these news stories, below, you can see how the "Fear of War" mentality has been created and is being maintained -- just as the House of Theosophy Director said in August, 1991, was so necessary [NEWS1052] if all the desired steps were to be realized. Steps 1 and 2 have been realized and we are apparently heading for Steps 3 and 4. Remember, Step 5 was the appearance of Antichrist! In NEWS1622, we gave several instances in which indicators seemed flashing for war. Let us update these war indicators with more recent articles. You will be shocked. NEWS BRIEF: "Deaths Overshadow Zinni Mission", by BBC News Middle East, 15 March, 2002. "A Palestinian woman and four children have died in an explosion near a Gaza refugee camp as US Middle East envoy Anthony Zinni pursued his latest peace mission. Palestinian officials said the woman, her three children and a young nephew had been riding in a donkey cart near al-Bureij camp when they detonated a landmine left behind by withdrawing Israeli security forces. Israel has denied any responsibility, saying the explosion was caused by Palestinian militants." NEWS BRIEF: "Three soldiers killed as tank hits mine", The Jerusalem Post, 15 March 2002. "KARNI (March 15) - Three soldiers were killed and two wounded, one moderately, when a Merkava Mk III tank drove over a powerful mine on the Karni-Netzarim road in the Gaza Strip yesterday morning." NEWS BRIEF: "IDF kills terrorist, captures second in Gaza Strip", The Jerusalem Post, 15 March 2002. "Army forces killed one terrorist and wounded and captured a second between Dugit and Elei Sinai in the northern Gaza Strip overnight. Soldiers opened fire on the two, seen near Dugit's security fence. The Palestinian who was killed was armed with a rifle and ammunition clips, fragmentation grenades, and wire cutters, Army Radio said. The second terrorist was captured after a short chase. Further south, soldiers opened fire on a group of armed Palestinians near the Kissufim road. The Palestinians fled towards nearby Khan Yunis." NEWS BRIEF: "AL-QAEDA Terror Team Hits With Savagery In Terror Attack In Galilee", DEBKAfile, 13 March 2002. "The terror attack Tuesday, March 12, in which six Israelis were killed and seven injured on the Matsuba-Kabri highway of W. Galilee had all the hallmarks of a military-guerrilla action. DEBKAfiles military and intelligence sources report it was a combined operation by al Qaeda militants, newly based in Lebanon, and Iran-backed Hizballah Islamic extremists belonging to a faction associated with the master terrorist Imad Mughniyeh ... The terrorists mounted a professional military assault. After sniping at the traffic from ambush, part of the team rushed downhill hurling grenades at the crippled vehicles. Still on the hill were two or three gunmen who covered the assault with long-range fire that prevented help approaching the stricken victims. The team therefore must have numbered at least four, probably more. The killers, upon reaching the road, took time to make sure their victims died, by cold-bloodedly shooting them all  whether dead or wounded - at close range with pistols equipped with silencers. Even then, they did not go before Israeli forces came on the scene, but lay in wait in a ditch. The Israelis, no sooner did they reach the shocking scene of carnage, found themselves under fierce gunfire from the hill. Under its cover, the men in the ditch hurled grenades." NEWS BRIEF: "Under cloud of terror, Israelis stay home more, and worry about their children", Israeli Insider, March 15, 2002. "Though Israelis are being urged to maintain their normal routines during a period with almost daily terror attacks, many citizens are finding it difficult to cope with their worries and fears. With each hourly news broadcast, the cloud of terror seems to be drawing closer and closer, and escaping from the constant threat of violence is not easy." NEWS BRIEF: "Palestinians press Zinni for support", BBC News, Middle East, 16 March 2002. "The US envoy to the Middle East, Anthony Zinni is holding talks with the Palestinian leadership on the third day of his peace-making mission. Mr. Zinni met a delegation including top Palestinian negotiator Saeb Erakat and Deputy Information Minister Yasser Abed Rabbo in the West Bank town of Ramallah ... Mr Zinni said his meetings with both sides had been positive. 'I sensed everyone is committed to get out of this terrible situation,' the former US Marines general said, after meeting Israeli prime minister Ariel Sharon and Palestinian leader Yasser Arafat. " NEWS BRIEF: "Zinni meets Arafat in Ramallah, sees cease-fire talks in 3 days", HA-ARETZ, March 16, 2002. "U.S. envoy Anthony Zinni met with Palestinian Authority Chairman Yasser Arafat in the West Bank city of Ramallah on Saturday for the second time since arriving Thursday. Zinni is to meet with Prime Minister Ariel Sharon at Sharon's Negev ranch in the evening ... After meeting with Arafat in Ramallah on Friday evening, Zinni said that he expected ceasefire talks between Israel and the Palestinians to begin in earnest within three days, after preliminary talks on 'mechanisms' to end fighting. 'I am encouraged that we are going to identify the mechanisms that allow us to do that, and I think that in the next three days that we can start on my mission and on the implementation of the plan that we have brought,' he said." Notice that Zinni admits that he has brought a plan with him; you may rest assured this plan was drawn up according to the dictates of the New Jerusalem Covenant Project! You may reasonably expect that this plan will involved a dramatic diplomatic breakthrough, a Palestinian State, great and swelling promises of peace, and International Control of Jerusalem. In other words, Step 3 of the New Jerusalem Covenant Project may about to be achieved. NEWS BRIEF: "Sarid: Bring In An International Force", The Jerusalem Post, March 15, 2002. "An international force led by the United States should separate warring Israelis and Palestinians, Opposition leader Yossi Sarid of the Meretz Party said this afternoon. Without such an active force, such as the ones deployed in Kosovo and Bosnia, the cease-fire mission of US envoy Anthony Zinni cannot succeed, Sarid told a meeting of the Middle East committee of the Socialist International in Tel Aviv. Sarid said the US should impose a settlement on the sides, because they are incapable of reaching one by themselves, Israel Radio reported." It is hot news, indeed, when even a liberal Israeli party such as Meretz would advocate bringing an international force into Israel; however, the conditioning of Jewish citizens to accept such an idea seems to be picking up speed. After enduring 30 years of Arab terror against civilian populations, the average Jewish citizen may be persuaded -- under the right promised conditions -- to accept a Jerusalem controlled by the International Community, especially if that international committee did not officially include the United Nations. If the United States were to take the active role in both the bargaining and the enforcement phase of Step 3, the Jewish citizens might accept such a deal. Therefore, you can see how events in Israel seem to be proceeding down two very different parallel paths: Dramatically increased warfare and an equally dramatic diplomatic initiative. One has to be very confused, for surely these two paths are not compatible; surely, you have to have either all-out war or peace. However, once you understand that two very different stages of one single plan are planned here, this whole thing makes sense. According to the New Jerusalem Covenant Project, a meaningful "Fear of War" must be created and maintained until all the steps are in place. Then, according to the Prophetic Scriptures and according to the Three World War Scenario of Albert Pike, all-out war is planned, out of which will stride Antichrist. We have addressed purely prophetic implications in NEWS1064, NEWS1103, NEWS1112, NEWS1222, NEWS1422, NEWS1505. The soon fulfillment of the Obadiah prophecy is treated in NEWS1422 and is a subject to which we shall return in a few moments. The Three World War Scenario is covered in NEWS1015 and NEWS1056, as a demonic being foretold Masonic leader, Albert Pike, that three world wars would be necessary to successfully bring Antichrist on to the world scene. History records that World Wars One and Two were fulfilled to the letter, while the third one is set to explode at the right time in world history. Such a war seems to be required by Scripture, Matthew 24 to be exact, as we detail in NEWS1408. However, it is with great interest that, even though the signs seem mixed between diplomacy and preparations for all-out war, Sharon has instructed the Israeli Defense Force [IDF] to prepare in a most peculiar way. Just before an aerial attack of the sort that would fulfill Obadiah 15-18 [NEWS1422], troops on the ground could be expected to mark the target zones so that pilots of aircraft and/or helicopters could visually see their targets. If the Israelis are going to use Fuel Air bombs as we think they are to annihilate the Palestinians, their pilots would need to precisely drop their ordinance so as to not kill Jewish citizens. This type of zone marking would be a last-minute preparation that seems absolutely essential. Further, the IDF could logically want to place obstacles along these target zones so that no Jewish citizen could get caught in the designated areas. Thus, Sharon's order to "begin marking the zones" and "placing obstacles along them" would seem to indicate that the final solution to the Palestinian-Israeli crisis is close at hand. "Let's start with Baruch Kimmering, a sociologist at Hebrew University. Here's what he sent to the Jerusalem Weekly Kol Ha'Ir last month, which duly published it: 'I accuse Ariel Sharon of creating a process in which he will not only intensify the reciprocal bloodshed, but is liable to instigate a regional war and partial or nearly complete ethnic cleansing of the Arabs in the Land of Israel ...' "
This professor made this charge only two weeks after Sharon ordered the IDF to begin marking the target zones and placing obstacles along them. As the professor looked upon these preparations, a light bulb may have gone off in his fertile brain, giving him the vision of genocide about which Obadiah spoke 2,500 years ago! The professor could read the signs on the ground, as the IDF marked the target zones. Therefore, as you read of the diplomatic breakthrough that may be just ahead of us, remember the zone markings of which Sharon spoke. As you read of the Palestinian State that may be close at hand, remember that the target zones are being marked off. Further, remember that the Palestinian cities and towns are now ringed with permanent fences, barriers of all types, and even anti-tank trenches. Unless you read that these barriers are being removed, you can remain very skeptical about the length of the newly created Palestinian State. Finally, remember that President Bush is continuing to plan an invasion of Iraq. At the same time as the Palestinian State may be created, American preparations will be reaching a conclusion. Bush may well launch his attack against Iraq shortly after the "Palestinian State" may be created. Experienced observers have warned that this attack may touch off an all-out regional war, with Arafat and his state getting caught in the crossfire. As a point of fact, though, Arafat may attack within Israel in support of Iraq once the American-led offensive begins. Just weeks ago, Arafat expressed his solidarity with Saddam Hussein.